A relative suggest that one of her favorite authors is Mike Omer and that I should try one of his novels. Spider’s Web seemed like a good place to start and I borrowed for free with Amazon Prime. Cannot beat that price. In the book, women’s bodies started showing up. Police looked for likely suspects and didn’t want to face the fact that there might be serial killer on the loose. This psychopath had a unique way of letting his victims know how they were going to die. By the time they figured it out, it was too late. Sprinkle in a reporter who would stop at nothing to get the story and you get Spider’s Web. This is no cozy mystery and will have you at the edge of your seat. This article was published on Jan 14, 2019 . 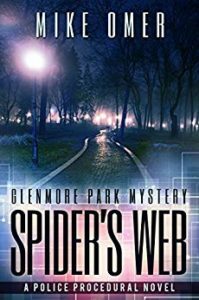 It is tagged Glenmore Park, Mike Omer, Spider's Web. You can follow any responses to this article through the comment RSS feed.